A photo exhibition of pupils' family cars organised at a preschool in the city of Shenzhen in southeast China has provoked a heated debate on class discrimination in schools. The activity was widely seen as the collection of financial information about the pupils' families. Many people took to China's Twitter-like platform Weibo to air their concerns that favouritism based on wealth is becoming entrenched in the country's education system. Following the outcry, the local authority stepped in to ban the project. 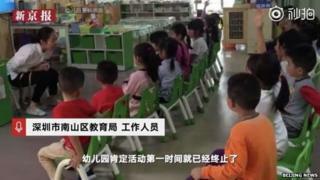 The controversial homework was assigned by Lihai Chuncheng Preschool on an online parents chat group. The teacher emphasised that the photos must show "a real car, and not a toy car". One of the parents, who suspected a more sinister motive behind the educational activity, posted a screenshot on Weibo. While some of those who responded argued that the parent being too sensitive, many others questioned the connection being made between education and cars, and scolded the school for ranking children according their families' wealth. One post pointed out that this kind of homework "harms the lower-class children's self-confidence" and "encourages children from well-to-do families to show off and outdo others". "I always think people who have toxic values shouldn't be teachers. Their shallowness will harm children's right attitude towards life," another person wrote. In response, the anonymous teacher dismissed it as "just an incident". Similarly, a member of Shenzhen's education department played it down as a "misunderstanding" and said the teachers involved were "engaged in introspection", Beijing News reports. The online response has shown passionate disapproval of the perceived favouritism based on social status in Chinese education. Lihai Chuncheng isn't the first school in Shenzhen to collect information that could reveal how prosperous a family is. In 2018, another local nursery conducted a "my home" survey, asking about the price and size of pupils' houses. And there have been other stories about teachers showing bias. Earlier this year, a teacher in Guangxi province was sacked over picking on a student whose parents work at a morgue. And last year, a mother in Heilongjiang province complained that her daughter was "shame paraded" through classrooms because she didn't give the teacher a gift. The fear of unfair treatment is such that almost half of Chinese parents surveyed have resorted to "bribing" teachers in 2018, according to the Global Times newspaper. Despite the ban on bribery and discrimination by the country's education ministry, there is a widespread lack of faith among parents in the system's fairness.